NatWest bank has lost a pensioner's safety deposit box which she said contained heirlooms worth more than £20,000. Hayat Panwar, 69, deposited the antique jewellery at the Solihull branch of the bank in February 2009. When she arrived at the branch in November 2012 and requested access to it, staff admitted they could not find the box or its contents. 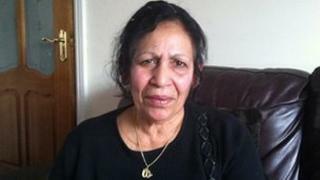 NatWest has apologised to Ms Panwar and offered to discuss compensation. She said the box contained antique jewellery and other items passed down through her family, which she said were irreplaceable. Ms Panwar said the items included her wedding and engagement rings, along with her father's watch and jewellery she inherited from her parents and grandparents, all of whom are no longer alive. Many of them were handed to her on her wedding day. "I just cried, I broke down," she said. "Since then I've been on medication, I haven't been the same, I wake up in the night, thinking about it. "It's affected my life and I don't know what to do." NatWest said it was doing all it could to locate the box. In a statement, the bank said: "In addition, we have made a request for information from Mrs Panwar as to the contents of the safety custody box, in order to discuss compensation to go some way to make amends for the loss she has experienced." The financial ombudsman said there were between 50 and 60 complaints a year about deposit boxes. The main themes tend to be disputes about the contents and complaints about damage. Ms Panwar said the heirlooms were "priceless" and promises of compensation were of little comfort. "I just want my gold back; I don't feel myself and I don't think I'd feel the same even if I got the money," she said. "It's part of my mum and dad and that's what I want back. I would love to give a piece to my children and grandchildren."